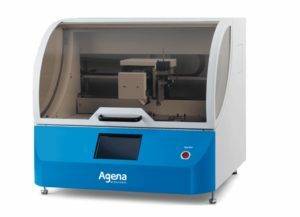 Feng Chi Biotech Corporation is the exclusive distribution of Agena MassARRAY products in Taiwan. We sell the reagents and instruments of the MassARRAY system, and we provides good after-sales service, such as customer product training and instrument maintenance. Our professional services team can help the customers to built up the protocol of MassARRAY. 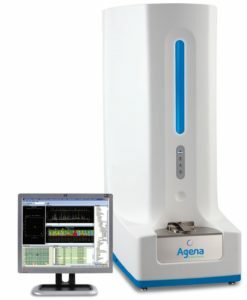 Agena MassARRAY Analyzer is a benchtop mass spectrometer that provides high throughput, sensitive, accurate, and rapid analysis of nucleic acid samples. 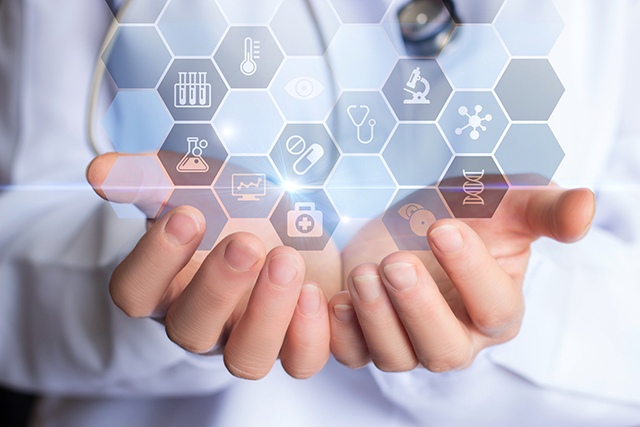 With throughput capacity to meet the needs of any testing volume, rapid results, and the ability to cost-eﬀectively target hundreds of genetic mutations, the MassARRAY System is a complete genomic solution for molecular laboratories. Nucleic acid detection by mass spectrometry enables readout by molecular mass, a highly accurate alternative to ﬂuorescent-based methods. 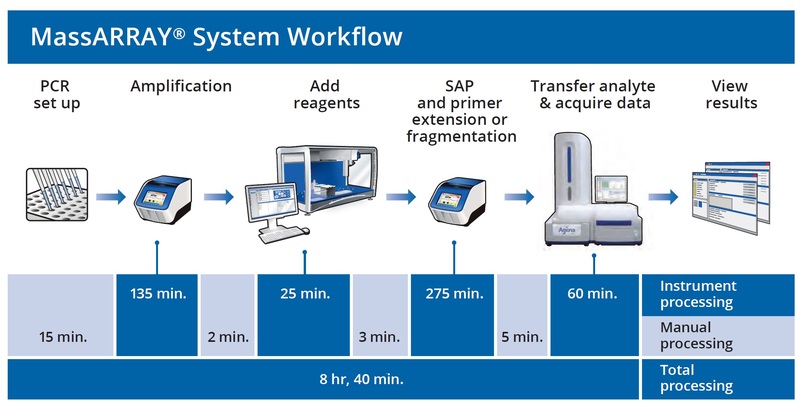 A system set up for 24-, 96- and/or 384-well format offers a variety of options for sample and assay throughput. Ideal for targeted genetic analysis including SNP genotyping, DNA methylation analysis, copy number quantification, and somatic mutation analysis. MassARRAY software provides ﬂexible and robust tools for the creation and analysis of new test methods. Online design tools enable you to design custom assays for genotyping, methylation, gene expression, or copy number variations. Obtain results in a single day with limited hands-on time—a new Chip prep module provides post-PCR automation. Analysis software provides interactive visualization of the data for results management and reporting. The Chip is loaded into the MassARRAY Analyzer 4 MALDI-TOF mass spectrometer, where the analyte/matrix co-crystals are desorbed and ionized. The analyte molecules are accelerated and their time-of-ﬂight is measured. The MassARRAY Analyzer 4 is designed to detect DNA within a mass range of approximately 4,500 Da to 9,000 Da, and can distinguish between analytes separated by 16 Da or more. (Analytes are typically 18-25 nucleotides.) Peak area ratios provide a quantitative readout. 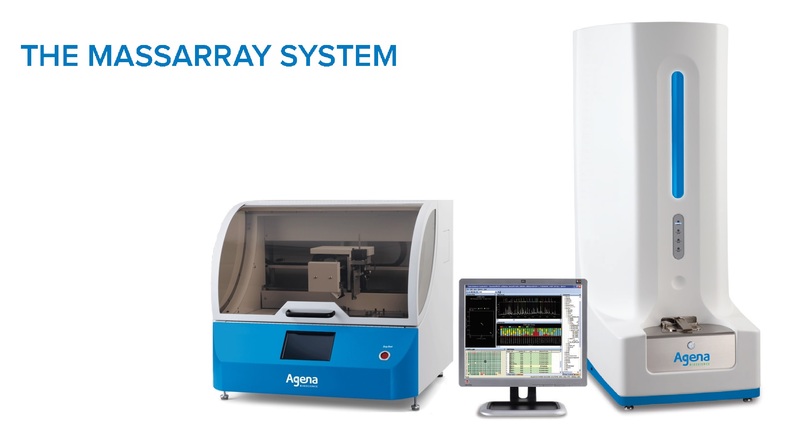 The MassARRAY System has the ability to automatically process up to two multiplexed 24-, 96-, or 384-pad SpectroCHIP Arrays per run, and comes with automated sample handling instruments based on the needs of your laboratory. 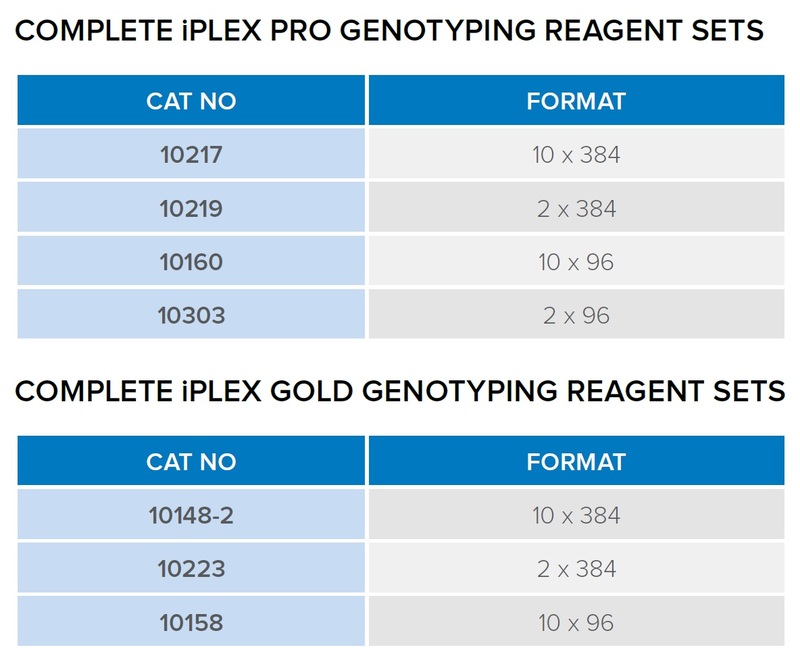 Two iPLEX reagent versions are available – iPLEX Gold for routine genotyping, and iPLEX Pro for more demanding applications that require high performance and sensitivity, such as somatic mutation analyses. Reagent sets are available in 96-well and 384-well formats. 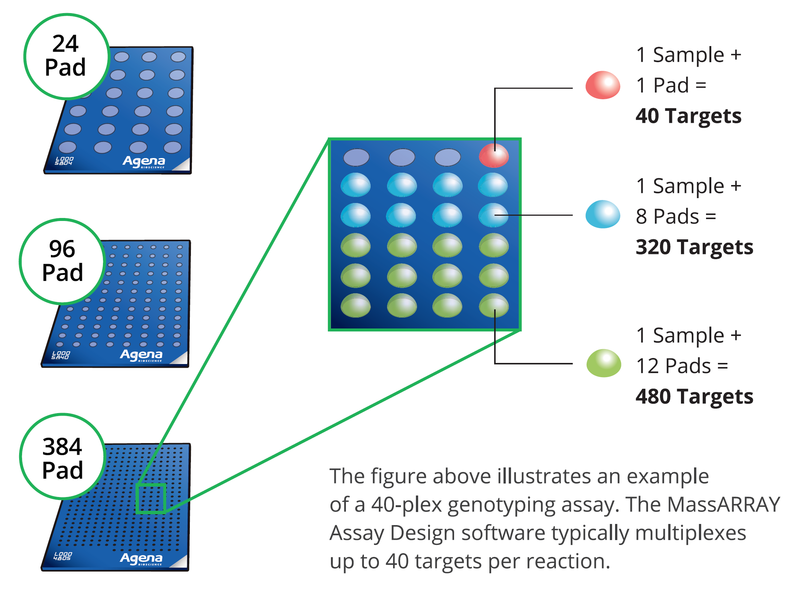 iPLEX reagent sets are designed to be used with the MassARRAY System with Typer 4 Software. The EpiTYPER Assay starts with PCR using T7-promotertagged reverse primers to amplify the target regions while preserving the bisulfte-induced sequence changes. After SAP treatment, in vitro transcription is performed and the resulting RNA transcripts are specifcally cleaved at uracil residues. The resulting fragments diﬀer in size and mass, depending on the sequence changes generated through bisulfte treatment. This diﬀerence allows the data analysis software to generate quantitative information for each analyzed target fragment. 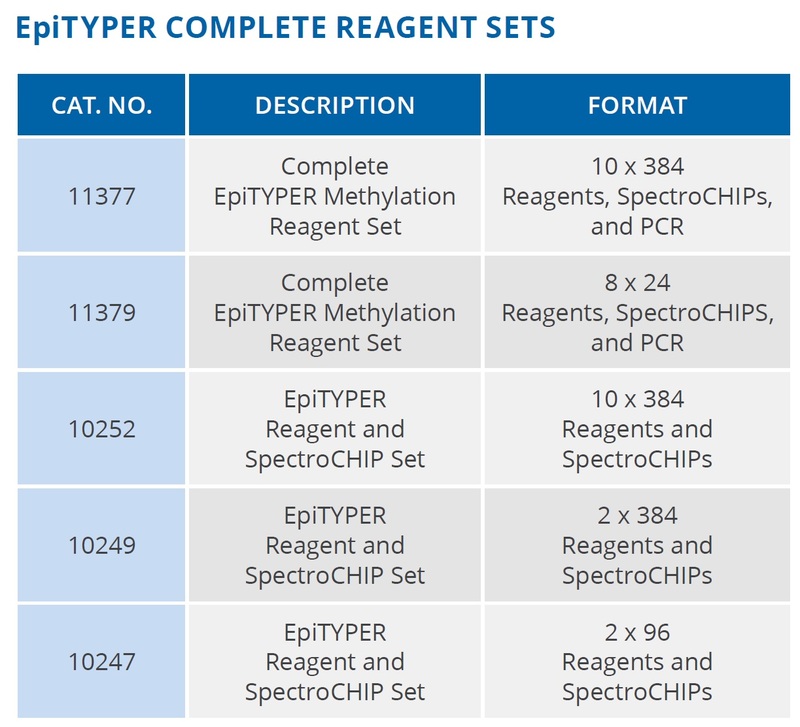 Reagent sets are available in 24-, 96-, and 384-well formats, and are designed for use with the MassARRAY System with EpiTYPER software.